^ a b c d Jenkins, Dennis R. (2007). 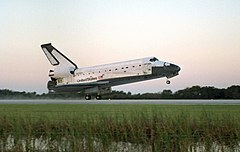 Space Shuttle: The History of the National Space Transportation System. Voyageur Press. pp. 524 pages. ISBN 0963397451.